It took me a while, but I finally finished another Avatar portrait. 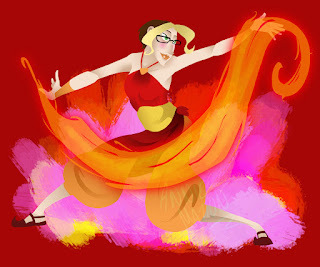 This one is my best friend Sarah, who we'd already decided would be a fire bender! I like how this turned out- I tried to do it the same way I painted up Sherry last night, and I'm pretty happy with it. It took a lot more work because Sarah had a lot more skin showing than Sherry did, but that's okay. I'm just happy it worked out. There you go Sarah! All done. this one really caught my eye the other day but I wasn't on the computer long enough to comment. Love the colours...very striking.